Steve Austin: How do you feel about spending $350m to solve a problem only to see it become ten times worse. That’s what the State Government has done with public money for the Fire Ant Eradication Program. Obviously, they haven’t eradicated anything. Today, Estimates hearings commence at State Parliament: the means by which MPs examine how public money is spent. As far as I can determine, this program is not on the agenda but perhaps should be. My story this morning is about what they should be looking at: a very expensive public policy failure in Queensland, involving State and Federal money. The question is why? My guest is Dr Pam Swepson who formerly worked for the Department of Primary Industries for 17 years. She was a policy advisor within the Fire Ant Eradication Program and, as you know, she became a whistle-blower a number of years ago. SA: Dr Pam Swepson, good morning to you again, Pam Swepson. PS: Good morning Steve and thank you very much. SA: Estimates (hearings) start today in State Parliament and as far as I can determine, they’re not looking at the Fire Ant Eradication Program. So, tell me Pam Swepson, why has the program been such an expensive failure to date? PS: My argument would be Steve, that it was a program that ignored the science and in doing so wasted a lot of public money, which consequently, made the program get worse. The problem, I think, stems from how the program is funded. The Queensland Government saw how much money comes into the State for an eradication program, so mounted an eradication program. SA: So we need to explain that don’t we. The State, if they promise to eradicate something, and that’s a specific word, the Federal Government will give them the money to do it. PS: 50% of the money comes from the Commonwealth, the rest of it comes from the other States and Queensland’s contribution to that is about 10%. So, there’s been a big push by the State to eradicate fire ants at the consequence (expense), I would say, of putting in place a decent containment program. Because, any hint of a program to contain the fire ant, the Queensland Government believed, made it look like they weren’t confident they could eradicate fire ants. So, my argument is, because of the hunt for the last fire ant to eradicate it to keep the Commonwealth money coming, the program failed to implement any decent control and containment measures. Because of that that, fire ants have spread ten times further than they were at the beginning. SA: As long as the State uses the word ‘eradication’ that keeps the money flow tap open from the Federal Government. Is that right? PS: More or less. The program has not been in eradication mode since 2009. The fourth and last scientific review of the program in 2009 said, categorically, the Queensland Government was NOT eradicating fire ants, recommended that it went back to a containment regime while it transitioned to eradicating, to try to improve their methods, so they could get back on track to eradication. Now, that hasn’t happened. The Commonwealth instigated another review last year. My understanding from the Minister is that the Commonwealth Ministers (the Agriculture Minister Ministerial Council) considered that in May this year and have not yet decided what to do; either in terms of whether the program moves into eradication mode, (or) goes back to containment mode which dumps it back onto Queensland, or how it will continue funding. So, I would think the Estimates Committee (hearings) needs to be thinking about what are they going to do with the eradication program once this final review is made public: whether it’s going to continue being a Commonwealth funded eradication program or not. Or whether it goes back to being a totally Queensland problem. SA: So, the Minister for Agriculture and Fisheries, Leanne Donaldson is the responsible Minister? SA: But isn’t there a reluctance on both sides of politics to dig too deeply into this because both sides of politics have fundamentally failed to get on top of this problem and both have been in power while the money has been flowing from the Commonwealth? Both have been there while the program has failed utterly and continues to fail? PS: Exactly. It failed from the beginning. In 2001, the fire ant infestation coincided with the coming into Government of the Beattie government. At the time there was high unemployment in Queensland and the Beattie Government came into power on the promise of ‘Jobs, Jobs, Jobs.’ Now, the United States experts who looked at the fire ant infestation in Queensland in 2001 said ‘It’s really bad: as bad as we have seen anywhere in the United States. You’ve got an outside chance of eradicating if you get the helicopters out and bait it by air as quickly and as effectively as you can.’ The Queensland Government decided not to do that but to create a jobs program for 400 field assistants. SA: So let me just interrupt there. The Queensland Government did bring out US experts and they came out and suggested a totally different strategy from what the State Government adopted. Does that mean we ignored the experts’ advice and they’ve been proved right and it’s a very expensive failure for the tax payer? PS: That’s only one example. The second example I’ll give to you is the aerial surveillance by helicopter. The (Liberal National Party) LNP government came in (to government) with a promise of ‘beefing up biosecurity’ but instead they cut funds to rely on ‘targeted surveillance’, as they called it, with helicopter surveillance. Now helicopter surveillance is not used by any other country in the world. The Queensland Government decided to put all of their money and effort into developing this totally new technology to find fire ants by helicopter. SA: Now there’s nothing wrong with that. If they had an original idea, I’d welcome that. There’s nothing wrong with coming up with something new. Was it evidence based or science based? PS: No. It wasn’t. The science review of 2009 warned them against it. They said the technology is too tricky, you’re likely to identify millions of things as fire ant nests and miss actual nests. SA: So they had qualified warnings not to do it? PS: That’s exactly right. It (aerial surveillance) didn’t happen this year because the program’s been going for about 5 or 6 years and it’s found about eleven nests. In the meantime, the fire ant infestation tripled. SA: So, we have to understand this. Multi-millions have been spent on this (aerial surveillance) program and they found eleven nests. PS: That’s about right. And in the meantime, the infestation tripled. So, you’ve got two examples of both sides of politics ignoring the science, wasting public money on unscientifically based programs and the consequences are that the problem is ten times as bad as it was. And it wold be my argument now, Steve, that things have got so bad that the Queensland government is ready to dump the whole problem back onto the public that’s already paid for it. SA: We’ll come to what the public’s about to be faced with in just a moment because there’s been no official announcement. There has been an announcement but not the way people expect. My guest, if you’ve just turned on your wireless is Pam Swepson. She is a whistle-blower who formerly worked for the Department of Primary Industries for 17 years. She was a policy advisor within the National Fire Ant Eradication Program, as it called, though as you’ve just heard, nothing’s been eradicated, in fact, it’s got ten times worse than it was. Pam Swepson, you went the lawful path of making what’s called a public interest disclosure under the Whistle-blowers’ Protection Act, I think it was called, and went to the Crime and Misconduct Commission (CMC), as it was then, and said ‘Look the Department is being mis-leading, they’re exaggerating the success of the program.’ The CMC had a look at it and said ‘Sorry, we do not rule in your favour. We don’t find any evidence to support you.’ How do you think that stands today then? PS: And it took them two and a half years to come to that conclusion. At that stage, it was a five-year program and the Americans had said there was a major sense of urgency to get something done here. So I would complain, that while the CMC was mucking around with their investigation, I kept asking the Premier at the time to act. He said ‘I can’t act while this is before the CMC.’ So, that delayed any action at the time, and their findings, I believe, just allowed the program to continue reporting the way it had been. And I would hold the CMC, in some part, responsible for the continuing spread of fire ants in Queensland. SA: Either way, we now have a major pest – a very aggressive fire ant from overseas in Queensland soil. PS: A super-pest. Entomologist say it is one of the worst invasions and infestations that you can have. 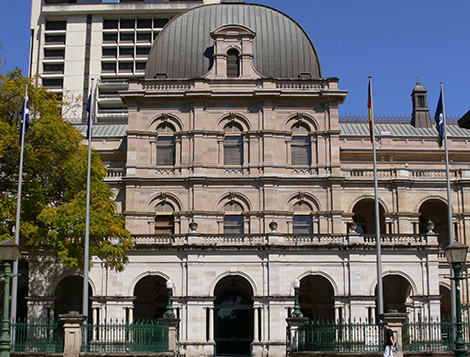 SA: You’re saying we’ve spent so far around $350m: it’s a bit over that, but somewhere between $350m and $400m, and the problem’s got ten times worse because both sides of politics in Queensland ignored the science and the advice they were given. PS: And wasted their money on programs that looked like an eradication program while avoiding putting any containment program in place which would have had some effect on reducing the massive spread that we’ve had. SA: So with Estimates hearings starting in State Parliament, what questions should be asked, though I won’t hold my breath? But what questions should be asked, Pam Swepson? PS: What is the nature of the future fire ant program? How much will the Queensland Government be involved in that? How will they fund it? What sort funding will be available? And how much will they start pushing the costs back onto industry and residents to pay for whatever future program there might be? SA: Now you note that on the first of July, just a couple of weeks ago, Queensland has a new Biosecurity Act. What are the implications of this new piece of legislation for Queenslanders and Queensland businesses in particular? PS: It brings in what is called the General Biosecurity Obligation which makes it a legal responsibility for people to ensure that they don’t spread any biosecurity risk, which is fair enough in a general sense. But consultation before that Act came into place was concerned that people would not know what to do. I mean, it’s been illegal to move a live fire ant since 2002 when the Plant Protection Regulation came in then. But because there were not enough biosecurity inspectors, that legislation has made no difference what so ever. But the Biosecurity Act has got a sting in the tail: people will be penalised if they don’t manage their risk of spreading fire ants and it also allows the Queensland Government to create private biosecurity consultants: people to inspect, to accredit businesses or residents and to audit those and to charge the public for those services; services which I would suggest the Queensland Government was supposed to provide with $350m of public money. SA: So what you’re telling me Dr Pam Swepson, is that the government failed, knew they failed, ignored the scientific advice and in July two weeks ago, they brought in a new Biosecurity Act which now pushes the whole of the obligation onto private businesses in Queensland or be fined or to pick up the tab for their General Biosecurity Obligation, as the Act calls it? SA: (Sighs) Do people realise this? I mean, do horticulturalists, do quarry owners, do trucks (owners), do people who are working on building sites, do they the know the liability that they now have or have had for the last two weeks? PS: I would doubt it. SA: Was there and debate or discussion about this element of the Biosecurity Act that you’re aware of? PS: There was some consultation with industry about that and they were concerned about people knowing what they would have to do, because it is quite complicated to manage your risk of spreading fire ants. Also I’ve been informing various organisations. I’ve been writing some blogs about this which I have sent to the Queensland Farmers’ Federation. They were interested in my blog about the Queensland Government creating a private biosecurity industry and dumping the fire ant problem back onto the public. SA: So $350m, against the science, it hasn’t worked, now it’s the public’s responsibility by law. SA: Pam Swepson, you’ve started a petition where you are calling on the now Deputy Prime Minister Barnaby Joyce to do something about this. The Commonwealth is picking up 50% of the money for this, what do you want him to do? PS: Require the Queensland Government to implement the aggressive containment program that the American experts said we needed in 2001. That means employing enough public biosecurity inspectors to identify businesses that deal in fire ant carriers like soil and mulch, help those businesses to develop risk management plans, accredit those businesses and audit them in some sort of a decent way. Because, the major cause of the spread of fire ants from Redlands through to the Lockyer Valley has been them moving around in truck-loads of fire ant friendly materials like soil and mulch. And by the way, Steve, they are not just spreading: they are coming back. In 2001 there were two epicentres of the infestation: one in the north-east around the Bay and the other in the south-west. Those two infestations have merged on the Fire Ant Restriction maps over time. But as of August last year, the Port which was supposed to have been declared eradicated, has been put back on the maps and so has Brisbane Airport. So, those two major areas that had been declared fire ant free are now back on the Fire Ant Restriction maps, as of this month. SA: Pam Swepson, I’ll speak with you again. Thank you so much. PS: Thank you very much Steve. SA: Dr Pam Swepson, formerly with the Department of Primary Industries, then a whistle-blower, started a petition calling on Barnaby Joyce to do something about one of the biggest public policy failures in Queensland in recent memory. And we have a few to choose from.